Danish game developer Playdead has produced a couple of creepy side-scrolling puzzle-platform games: LIMBO and INSIDE. These games use polygonal graphics to render the environment, which creates a 3D appearance. But the gameplay is restricted to a 2D plane, meaning you can only move left and right, up and down. INSIDE looks even more 3D than LIMBO, with its more detailed visuals. The artwork in LIMBO is very minimalist, but even so the gameplay is very immersive. It’s interesting to see how monochromatic colors can be used to set a mood, and how even the simplest shapes can fool you. LIMBO is a dark and somber game in black-and-white tones. The main character is a nameless boy, who is traversing a spooky forest in search of his lost sister. The lighting effects and minimal ambient sounds in this game create an eerie, haunting atmosphere often associated with the horror genre. The shadowy grayscale graphics hide numerous environmental and physical hazards, such as deadly bear traps on the forest floor, and dangerous beasts hiding in the shadows. Watch out for the giant spider. SO CREEPY! There are also mechanical puzzles and traps using machinery, electromagnets, and gravity. This game imparts a deep feeling of loneliness and a sense of always being on edge. LIMBO does have a gore filter that blacks out the screen instead of showing your character’s death, but I still wouldn’t let young kids watch it. The game is scary and it might give them nightmares. LIMBO is rated T for TEEN. INSIDE is the sequel to LIMBO. The premise of this game is a boy running away from unnamed bad guys. He runs, and runs, and runs. But you have no idea what’s going on or why. Nothing is explained. He begins in a dark forested area. It has the appearance of being cold, rainy, and frightening. He runs downhill into a swampy area while being pursued by dogs, people with guns, and a van. Wherever he goes, someone is trying to get him! Not only that, everything is surreal, like a bad dream! I mean some things are really weird, in the style of sci-fi horror, like parasitic worms and a strange blob. Again, the atmospheric effects are gloomy, oppressive, and you never feel safe anywhere. All you can do is keep running, solving puzzles, and escaping with your life. It’s moody, macabre at times, and a hopeless, unpleasant experience from beginning to end. This one is definitely not for kids. INSIDE is rated M for Mature. I like LIMBO the best out of these two games, because it’s so simple yet effective and it’s scary without being weird. You can get LIMBO: Special Edition for PC/Mac in a boxed set with lots of cool extras! 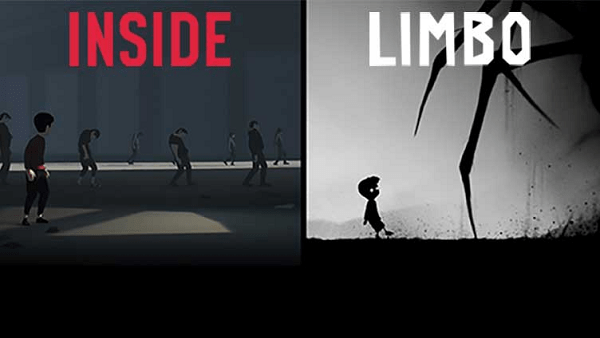 Both LIMBO and INSIDE are available to download on Steam. You can also get them in a double pack for Xbox One and PS4.